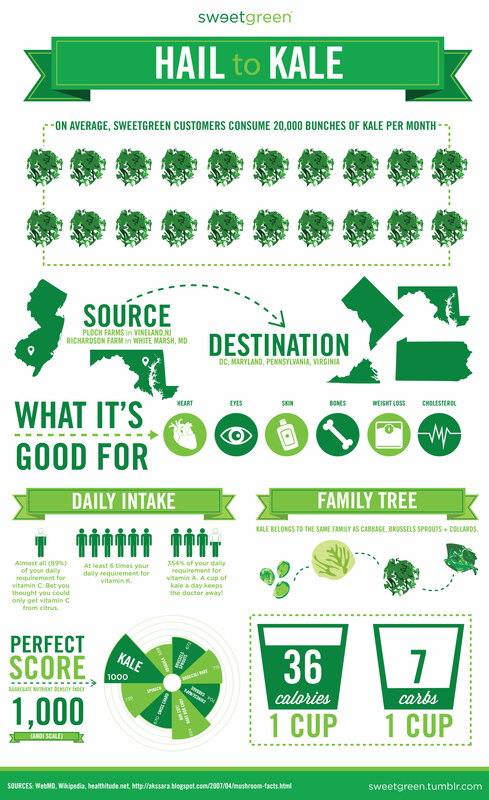 Hail to Kale is an infographic produced by Sweet Green that looks at the rise of the super food Kale. The company sell around 20,000 bunches of Kale a month so have seen the boom in Kale consumption first hand. The infographic looks at how just why Kale has become so popular with it's nutrient packed leaves and offers up specific info on just what vitamins it provides. It also shows how Kale hits a perfect score of 1,000 on the Aggregate Nutrient Density Index - a measurement of just how packed with nutrients the vegetable is.